Samsung Electronics has stepped up its preparations for its battle with Japanese firms for leadership in organic light-emitting diode (OLED) displays. On Monday, Samsung Display was launched as an affiliate of the flagship Samsung firm in Tangjeong, South Chungcheong Province. 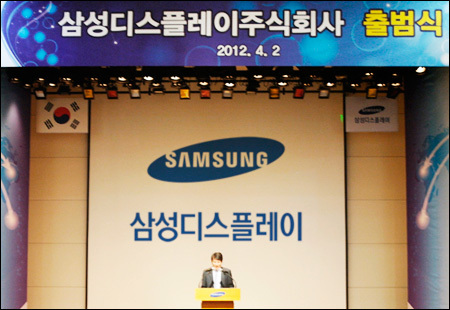 Samsung Display will run LCD and OLED display businesses with a combined annual revenue of at least 30 trillion won. That would make it the biggest display company in the world. The new entity has five global manufacturing bases with some 20,000, according to the firm. ``Samsung has done well in display businesses and the outlook is good,’’ said Park Dong-keun, president of Samsung Display in a message to employees. The move comes after struggling Japanese electronics giants Sony, Toshiba and Hitachi made a mega-merger deal. The trio signed definitive agreements with Innovation Network Corporation of Japan (INCJ) to integrate their display businesses. `Japan Display’’ will start its business this week, officials said. ``Korea’s Samsung is now battling Japan Inc. This is very interesting. The merger deal in Japan was aimed at beating Samsung in next-generation displays. The key point is how we effectively secure our bottom line,’’ said a senior Samsung executive, asking not to be named. Amid the flattening growth in conventional LCDs, Samsung is planning to massively increase its investment for OLEDs, regarded as the next-generation of flat screens. Samsung Display will deal the biggest blow to local rival LG Display and it’s expected the bottom line of Japan Display could also be squeezed as Samsung can boost product output in the shortest time. ``The global flat-screen industry is seeing a paradigm shift with makers spending on the rising and profitable OLED screens. Japan has an edge in patents and key technology, however, Samsung is ready to gain an initial lead by boosting its business volume,’’ said a senior fund manager from a U.S.-based investment bank in Hong Kong by telephone. All flat-screen makers are struggling by a price drop of LCD panels. But the LCD sector is already crowded, meaning Samsung and even LG are losing their bargaining power in the saturated market. LG Display spokesman Gary Sohn declined to comment on the impact of Samsung Display in the global market, however, he said LG, the world’s No. 2 maker of flat screens, is investing more for OLEDs as planned. Thanks to the increased volume, chances have been raised to ship Samsung’s OLEDs for Apple’s iPads and even iPhones, said unnamed Samsung executives on the condition of anonymity. ``So far, Apple has questions over an output commitment and product volume as Samsung’s OLED business isn’t on full track. But chances have risen to break the wall,’’ said one Samsung executive. Apple is Samsung’s biggest customer, buying $7.8 billion of components such as memory chips and LCDs in 2011. This year, it will buy around $11 billion of Samsung parts despite the deepening legal battle between the two companies. Apple spokesman Steve Park declined to comment.